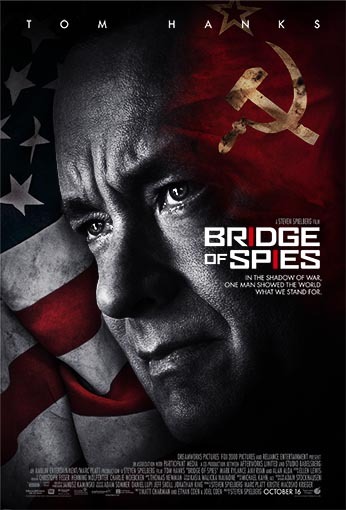 Directed by three-time Academy Award®-winning director Steven Spielberg, Bridge of Spies stars: two-time Academy Award® winner Tom Hanks as James Donovan; three-time Tony Award® winner Mark Rylance as Rudolf Abel, a KGB agent defended by Donovan; Scott Shepherd as CIA operative Hoffman; Academy Award® nominee Amy Ryan as James’ wife, Mary; Sebastian Koch as East German lawyer Vogel; and Academy Award® nominee Alan Alda as Thomas Watters, a partner at Donovan’s law firm. The film is produced by Spielberg, Marc Platt and Kristie Macosko Krieger with Adam Somner, Daniel Lupi, Jeff Skoll and Jonathan King serving as executive producers. The screenplay is by Matt Charman and three-time Academy Award® winners Ethan Coen & Joel Coen. Bridge of Spies will be released in theaters on October 16, 2015.